Jean Tracy is a prolific writer, and one of the best parent advisers around. 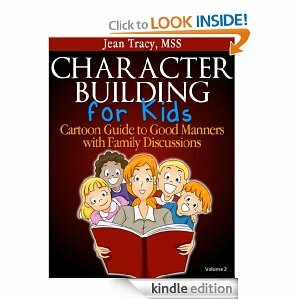 I knew I would have to deal with envy when I decided to download her newest book – Character Building for Kids: Cartoon Guide to Good Manners with Family Discussions. And yes, I turned a bit pea-green with envy as I laughed me way through her book. But because I promote laughter as one way to deal with negative feelings, I practiced my own advice and let the laughter take over, and my usual coloring was soon restored. The book is worth buying just for the laughs. Equally, worthwhile, however, are the parent guides lines, clear and useful directions for using the cartoons to teach your kids how to be more mannerly. As somewhat of an expert, I need to tell you that all the current research shows that if you want your kids to get ahead, you need to teach manners. Ms. Tracy’s book makes that easy pumpkin pie. You will not regret buying this one. Remember my books are out there also and while I am envious of Ms. Tracy, I remain proud of my books. Tame the Test Anxiety Monster is available for the rest of the week at the reduced rate of 99 cents. If you buy it please review it. Reviews build readers. If you don’t have a Kindle, Amazon has a free app you can use to read their books on your computer. Here are my other E-books, more are coming. How to Hold a Successful Family Meeting. Meanwhile, thank you and stay strong, laughing will help. This entry was posted in News, Parenting Issues and tagged Book review, children, Humor, Jean Tracy, Life, parenting, parenting tips, parents, postaday. Bookmark the permalink.